What to do with a very excitable Irish Setter... — Havers Dog Behaviour. I haven’t worked with an Irish Setter for a long time, this shows they are a breed who’s popularity is on the decline due to the desire for anything crossed with a poodle! Irish Setters are beautiful and majestic dogs with long flowing coats of a gorgeous deep red and they can be very excitable. They are lovely, gentle souls, deeply affectionate and they can be quite stubborn. Knowing what to expect when you walk into a new clients house and encounter their dog for the first time is a gamble but I knew what to expect when i walked in and that was a large dog up at face height using its claws as it jumped up and that is exactly what I got. Irish Setters and a large dog and can jump off the ground vertically and get to between five and six feet off the ground. I am 6’ 3” and of a large frame (the diet is going well by the way) and I am not worried by dogs but a smaller framed person would be concerned by a dog getting that far off the floor. Why do dogs like Rufus behave in this way? This behaviour is present in most dogs but smaller dogs are not considered to be such a nuisance as larger dogs but the dog should not feel the need to be jumping at you or at a visitor. If you encourage your dog to jump up at you in the morning or when you come home and you fuss your dog for doing it, you are effectively teaching your dog to jump up everyone who comes to your house. Your visitors will fuss your dog for jumping up because you are allowing your dog to jump up them so they think they have to interact with your dog. If your dog was greeted by you for being calmer and for having four feet on the ground, that is how your dog will expect to greet visitors. If you greet your dog away from the front door, your dog will stop being excited at the front door. Two top tips for you to make changes to how you behave with your dog so your dog will change their behaviour. The photograph above is Rufus towards the end of our session. He gave us plenty of behaviours to work with that he considered his best work as those behaviours have always generated the most attention but simply by switching our attention to the behaviours we wanted, he soon realised he had to change his ways and quickly adopted the calm behaviour that was being praised, this also continued when his owners walked out of the room where he was whereas before he would have followed them wherever they went. The purpose of my dog behaviour home visits is to show the owners how to deal with unwanted behaviours, how and when to praise good behaviour but most importantly to show the owners just what their dog is capable of. 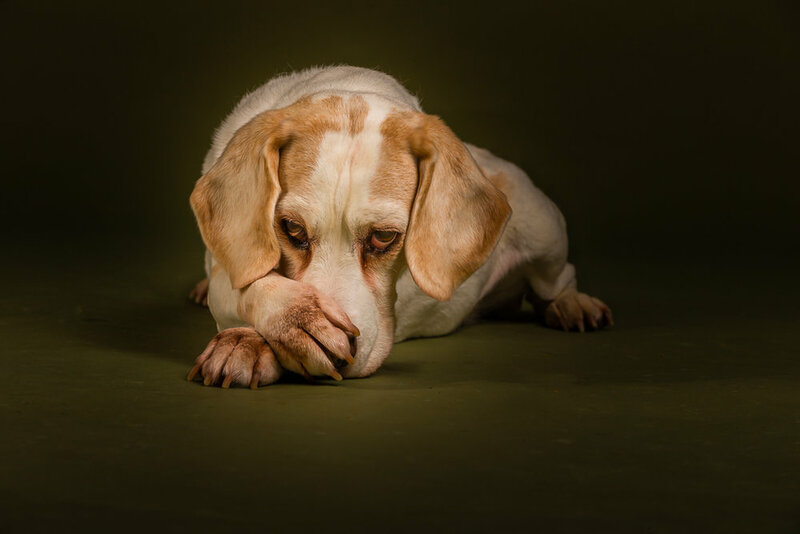 When you have been living with unwanted behaviour for a while, it can be difficult to see a way out and difficult to remember that your dog used to be better behaved so when an owner sees their dog relax and change in front of their eyes, it can be a very emotional moment which can give them the incentive to put the work in and make the consistent changes necessary. Rufus’ owners are exactly that because we had a second session booked which they have just cancelled because they have seen such a change in Rufus and are now confident they can keep up the necessary changes they are confident to continue on their own. This is the best news I get because it means both the dog and the owners have returned to a balanced life and an enjoyable one where they enjoy their dog instead of enduring their dog. They will have my ongoing support whenever they need it and that can be a simple email asking a question or a return visit if needed but they are working well and I am very proud of their success.